What are the pitfalls that you should avoid while giving a virtual interview? How to improve your chances at a remote interview session? Is it different from a traditional face-to-face interview? A virtual interview is your show, your time to shine. Preparation is essential to present your best self to the interviewer. Without a doubt, video dominates in the digital space. Cisco's Visual Network Index predicts that by the year 2021, 82% of internet traffic will be video. The recruitment space is no different and it is only natural that the influence of video should stake its claim aggressively over the last few years: be it through video interviews, social content or live broadcasts. The 2017 Deloitte Millennial Survey found that 64% of people surveyed preferred flexible work arrangements, a 21 % increase from 2016. Hence, the recruitment landscape is also changing to accommodate these shifts in behavior, one of which is using video platforms to communicate. As the Head of Campus Recruitment, Asia Pacific at Credit Suisse, I have observed virtual interviews and would like to share some tips on how candidates can help prepare for this stage of the process. Candidates should dedicate equal focus and preparation to this medium. In a way, one should prepare for a video interview in the same way as one would prepare for a face-to-face one. Give yourself time to test the equipment and connection. It is advisable to do so one day ahead of schedule and give yourself 30 minutes before the interview to set up. Do check whether the WIFI connection works or if you have to switch to a 4G network. Similarly, it is advisable to check the video recording capability on the device that you will be using as well as whether the sound is being captured. Ensure that you are filming yourself against a clean background with no posters, cuddly toys or anything that would shift the interviewer's focus away from you. A minimalistic background sets a professional tone and makes it easier for the interviewer to concentrate on you. Do you recall when BBC News presenter, Robert Kelly's, children marched into the room in the middle of his segment? You want to ensure that you will not be interrupted during the interview. Keep the focus on you. Lock the door. Ask for privacy. This allows you and the interviewer to focus without the risk of distractions. Framing is an often overlooked aspect. The focus of the interview should be you and this should provide the interviewer with an opportunity to assess your energy, enthusiasm and personality. A mid-shot is recommended: waist or chest up, but be careful that it is not too much of a close-up. Similarly, you do not want to appear too distant or a speck in a screen. Aesthetics are important and with the right framing, ensuring that the interviewer has the opportunity to process your visual cues, half the battle is won. Former supermodel Janice Dickinson said, “I find the light and work it, work it, work it.” Essentially, the virtual interview is your show: your time to shine. Without adequate lighting, it will be difficult for the interviewer to see you, let alone assess you. “Dress for the Job You Want”: Just because an interview is conducted remotely, does not mean that you should not put in the added effort to look good. You always want to look your best for an interview, so make sure that you are well-groomed and presentable. If the job or culture of the department calls for business attire, you should also wear business attire for your video interview. Avoid wearing accessories which can be distracting, catch light from the wrong angle or can make a noise on camera. Choose clothes that suit your chosen backdrop as opposed to clashes with it. 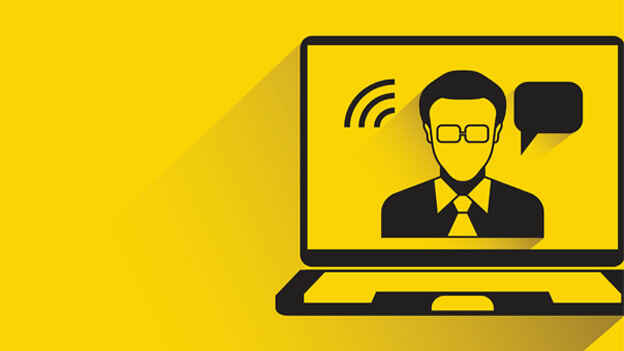 What makes a good virtual interview? It's just a like a good television show. Good content, a lot of hard work and preparation. A 2014 study by Cornell University found that when you fail to make eye contact with your audience, you look less authoritative, less believable and less confident. Moreover, when you don't look people in the eye, they are less likely to look at you. When they stop looking at you, they start thinking about something other than what you're saying and when that happens, they stop listening. Don't squander this chance to get to know the organization and be sincere in maintaining eye contact to find out more. Practice talking to the camera. It might not seem natural at first but this will help in the long run. Vincent Van Gogh once said that “Great things are done by a series of small things brought together.” It would be a shame if what could potentially be a good interview falls flat due to a series of minor things such as you not being aware of the message being sent by your body language. Be cognizant of your body's gestures and movements, to keep these under control and not distract the interviewer from you and what you have to say. It's fine to gesture while you speak, but keep your movements to a minimum and within the video frame. Be mindful that your gestures will not always translate over a video the same way they would in person. Do not fidget or worse, act bored or distracted or check your phone. These are absolute no-nos. As in point 3, control your environment to remove distractions so that your sole focus is on the interviewer. “When I'm performing, I'm not even thinking about the song. I'm thinking about the audience.” Sam Smith is amazingly talented and focused performer. Similarly, it would be good to channel your focus during a virtual interview to the audience. This is your time and it would be a shame if anything else got in the way. What makes a good show or performance? Innate ability, talent, and charisma are definite contributors, but at the same time, it takes a lot of hard work and preparation. So practice your content so that when you speak, it comes naturally to you. Don't let your surroundings fail you. Control every element where possible so that it does not distract you from your end goal of focusing on the interviewer and landing yourself that job. Best of luck in your next virtual interview!